To tell you the truth, my favorite kind of jelly in the world is salmonberry jelly. And, of course, you can not get salmonberry jelly from a typical grocery store. I believe a couple of specialty companies in Alaska sell small jars, but, really, the quality, compared to what you can make in your own kitchen, is very poor. Kind of tasteless and rubbery. If you live in an area where you can pick wild salmonberries, you need to go do it! If you live in Alaska where the Alaska Native Claims Settlement Act is in effect, you most likey will need to get a permit to access private land. If I had my druthers, a specific berry picking permit would be required!! A prerequisite to getting that permit would be taking a class in berry picking protocol!! Ripe salmonberries, from different geographic areas, are extremely different in appearance. The color can range from a light orangish yellow to an almost black-red. You should make sure you know what color a ripe salmonberry looks like in your area before picking. I say this because there is ABSOLUTELY no comparison between an unripe berry and a ripe berry. I would go so far to say that those people who profess not to like salmonberries have never had a ripe one. An unripe berry is bitter. A ripe berry is delicately sweet. 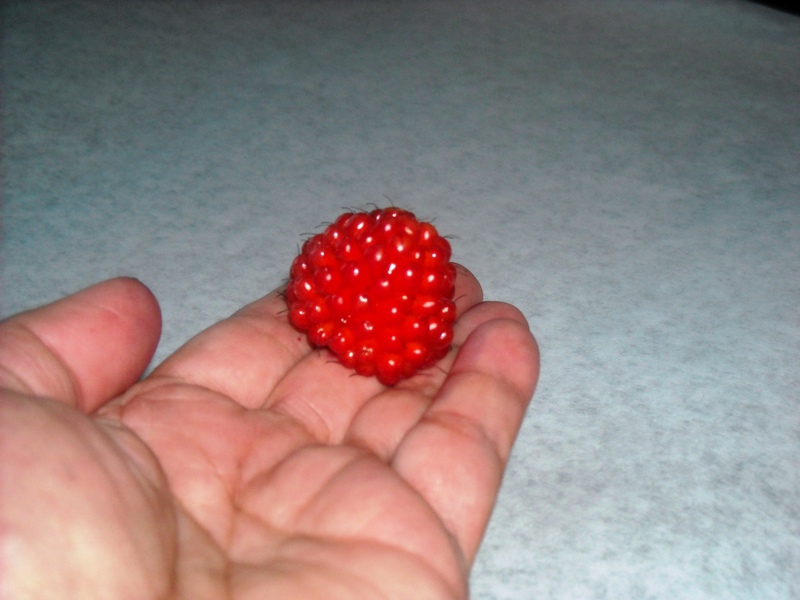 Now this is a ripe Unalaska salmonberry! Now that we have established when to pick salmonberries, let’s talk about how to pick salmonberries. This all may sound kind of simple in tone, but unless someone tells you that you are doing something wrong, I guess you will never know. A salmonberry patch should never look like a bulldozer has been through it. Yes, there will be paths through the berries, but there should not be any broken, stomped and crushed salmonberry bushes lying in your wake. There are natural paths through the bushes – go where there are other plants growing – monkshood, putchky, wild rye grass. By using these paths, you will not be guilty of breaking salmonberry bushes. 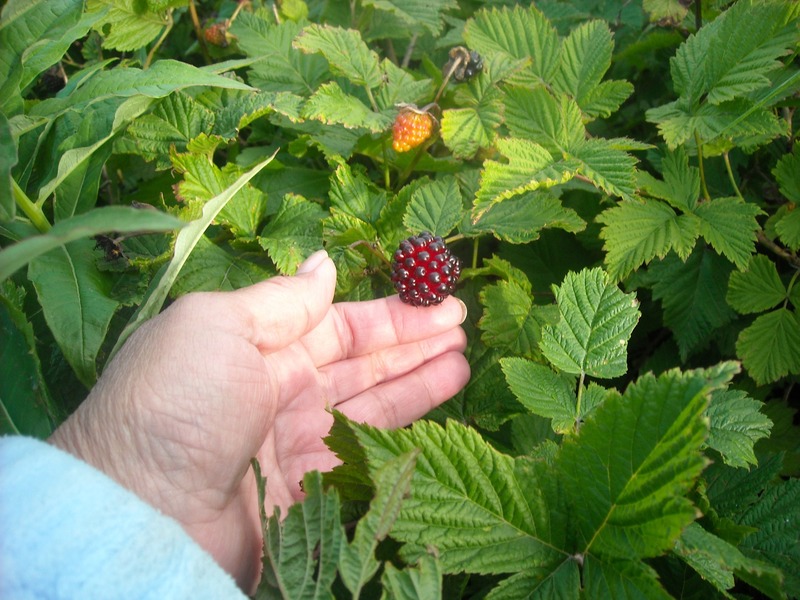 It takes many years for a salmonberry bush to grow and produce the size berries that you are looking for, and also many years for the bush to be able to produce two and sometimes three crops during a short season. 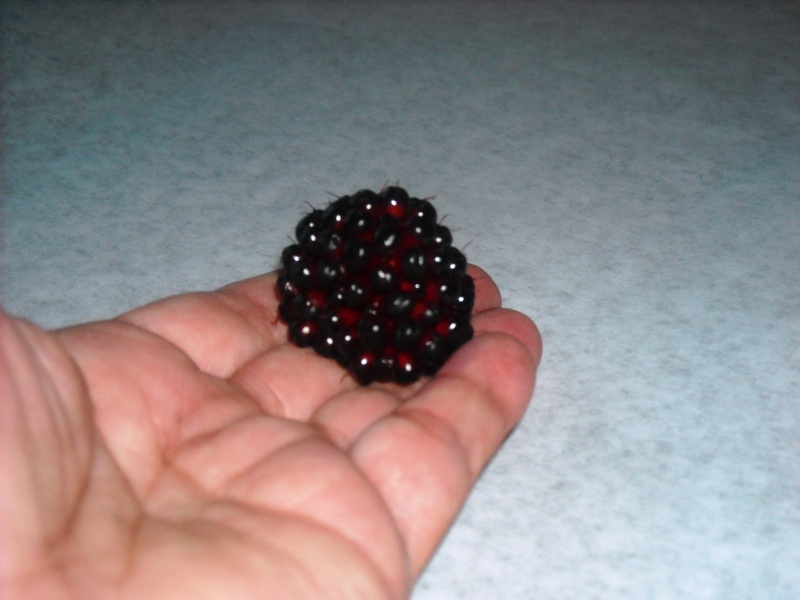 I have actually seen berry patches disappear in a season if they sustain enough damage. Diane picking berries without destruction in her wake. Careful picking also insures that you are NOT knocking off the unripe berries. Unripe berries will ripen in a few days and you can come back to a patch 2 or 3 times. If you are picking berries when they are not ripe, or knocking berries off bushes, you are affecting everyone else’s enjoyment of ripe berries and an adequate supply. If you approach a salmonberry patch and someone is already picking there, go find another patch and try the occupied patch several days later. Common sense and good manners. I never make salmonberry jam. I think that the salmonberry seeds are too big and eventually, if not immediately, can affect the taste of the jam. I am a proponent of salmonberry jelly. There are two ways you can make salmonberry jelly. The first way is the absolutely pure and natural way. You make your jelly this way when you have so much salmonberry juice, you don’t know what to do with it. The second way is when you are being stingy because the salmonberry year was not so prolific. The easiest and best way to get juice from your berries is to first freeze the berries. Yes – I said freeze them. It is a proven fact – by I don’t know who – that frozen berries produce more juice than berries fresh off the bush. Isn’t that crazy?? Next….and this is just a personal fetish….is to use a pressure cooker to extract the juice. If you crush and squeeze the berries, your jelly is going to be cloudy. By using a pressure cooker, your juice comes out very clear. So put the berries in the pressure cooker and add about 1/4 cup of water. It doesn’t matter how many berries you use – you can fill the pressure cooker to the rim, but a 1/4 cup of water is really all you need. Bring the pressure cooker up to 15 pounds, then turn off the heat and let the pressure drop to normal. Strain the juice from the pulp simply by using a collander with the appropriate size holes. Refrain from pressing the berries; a simple toss up and down will suffice to allow the juice to drain. Measure 4 cups juice into a large, tall pot and add the sugar, butter, and lemon juice. The butter keeps the boiling juice from foaming too much. Cook, at a full rolling boil, until the jelly stage is reached, testing after the first 5 minutes of rapid boil. To test for the jelly stage, dip a cold, metal spoon into the boiling liquid and then hold it from 12 to 18 inches above the pan but out of the path of rising steam. Turn the spoon so the jelly runs off the edge. If 2 or more drops form and run together before dripping off the edge of the spoon as separate drops, the jelly state has been reached. It usually takes from 8 to 15 minutes to reach the sheet or jelly stage. (A lot of evaporation occurs, and you can lose up to 2 jars of finished jelly by using this method.) Skim off the foam and pour the jelly quickly into hot, sterilized jelly jars. Seal with lids or paraffin. This recipe calls for a lot of sugar, but when berries are scarce and juice is limited, this is the only way to go. You are assured of a quick jell. Measure 4 cups juice into a large, tall pot and add the sugar, butter, and lemon juice. The butter keeps the boiling juice from foaming too much. Bring to a full, rolling boil that can not be stirred down. Add two pouches of liquid Certo and bring back to a full, rolling boil. Boil for 1 minutes and remove from heat. Skim any foam, ladle the jelly into jars, and seal. Salmonberry jelly on toast – the best. Salmonberry jelly on alaadix^ – even better. Peanut butter and jelly sandwich, but no salmonberry jelly makes my grandson pout, big time. If you want to freeze berries for use at a later time to top cakes, etc. 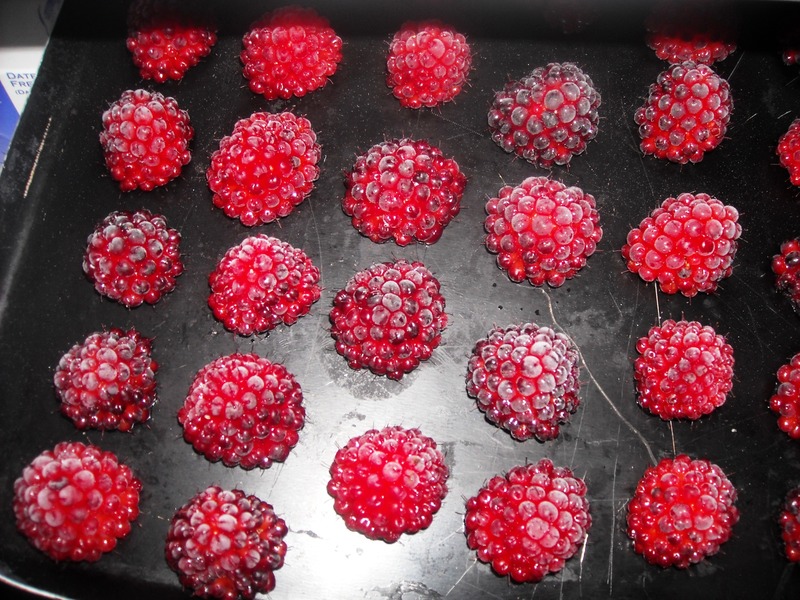 the best way to do so, if you want an excellent presentation, is to freeze the berries indivdually on a cookie sheet. 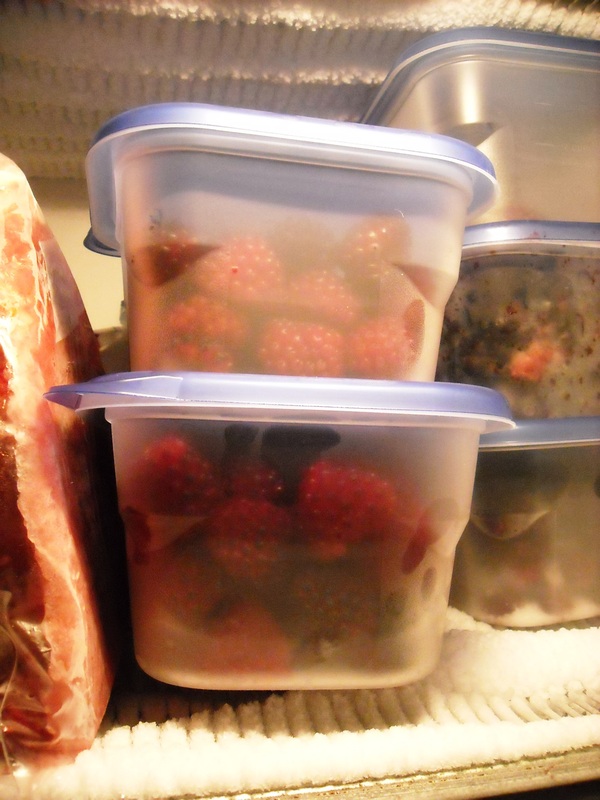 Once the berries have frozen, you can pack them lightly in a container. Berries will hold their shape if frozen singly and packed loosely. Don’t pack them to tightly or you will defeat your purpose. Take care of your berries as soon as you get home. Of course this means you should pick a reasonable amount. If you can’t process 10 gallons, for god’s sake don’t pick 10 gallons. Actually, I have never heard of anyone picking 10 gallons of salmonberries. They probably would be banned from the island if they were so greedy! Never take more than you can use. That is one of the first rules of gathering. If you follow all the rules, we really don’t mind sharing!!! Six berries! Oh, you need to send me your address so that I can send you a jar of jelly. That is so kind of you! I can’t seem to find your email address anywhere though…? Thank you for your kind response on my blog entry about sharing, also. I didn’t want to respond any more to that thread though because reading my sister’s angry posts upsets me. Everywhere in town is still little and green; but I found a patch that just keeps on giving! I have over 2 quarts now, and keep picking and freezing them as they ripen! Can’t get a small pressure cooker here in Valdez, so I will follow the recipe from my sister in law I Holy Cross. Thanks for all the good info! I can’t believe how hard it is to get a recipe for salmonberry JELLY; everyone is doing jam! I’m glad I found this page. Salmonberry jelly! Seven 8oz jars from 2 quarts of berries. Tasted of course; it’s yummy! A three hour job, but well worth it. I, of course, used your pressure cooker method of extracting the juice, and it worked wonderfully! 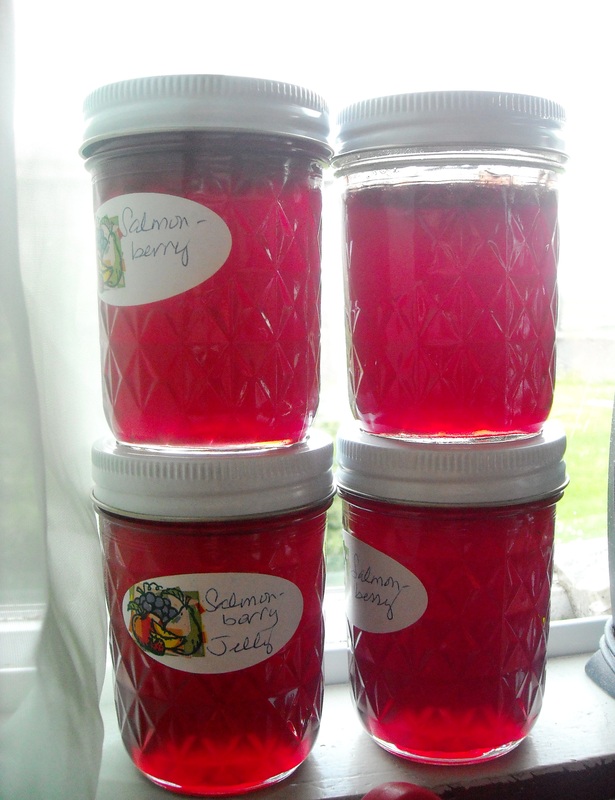 I have never done Salmonberry jelly before, and I have to credit your page to my success! But I have been making jams for a while, and I do know how to judge when it’s reaching jell phase! Wish I could put a pic of my jellies here! Salmonberries are my Sasha’s favorite berry…especially frozen. Rubies. I made 4 cases of jelly, just finished cooking down more berries. To make more got over a gallon of juice. Yes. I just like the convenience and ease of the liquid pectin. I don’t like trying to get rid of the clumps of pectin. 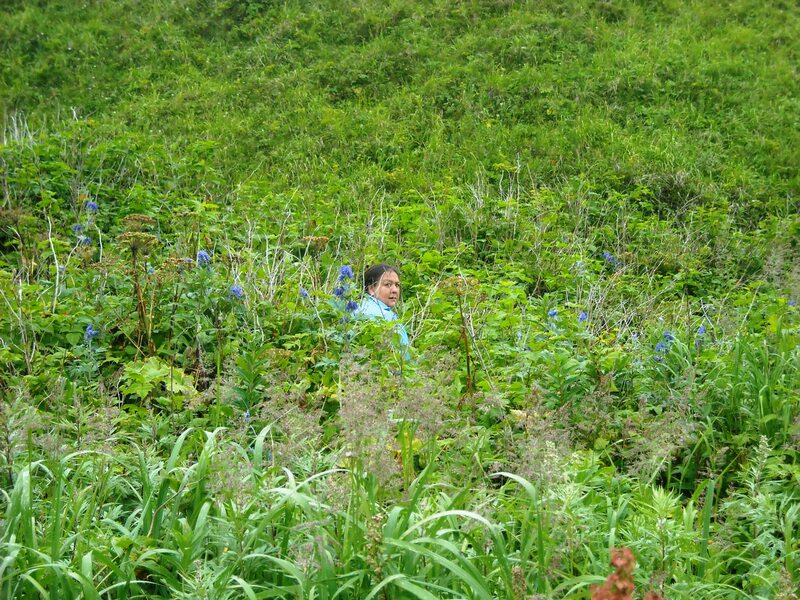 Unfortunately, Kyle, everyone I know gathers for subsistence in the Aleutians and we don’t sell our berries. You might contact Alaska Wildberry Products to see if they have any leads for you. Wow that was so well done. Very culturally sound along with enviromentally mindful. Nice work…. Reminded me of berry picking days in akutan. Qagalakux! Thanks, Dianna. My brother-in-law has a name for me and my penchant for bossing people around….and it is not nice, lol. I believe your time in your Salmonberry Jelly #2 is incorrect, or I’m doing something wrong. Just boil for 1 minute after adding the Certo? We tried this and got salmonberry syrup. Please let me know if that was a typo, I’m thinking it should boil 10-15 minutes. I LOVE your idea of putting all the berries in a pressure cooker, we get beautiful berry juice!! Never mind, I’m obviously new at this. Just found out you can’t replace the liquid certo with the powdered pectin. Lesson learned. Jelly….sometimes you have to let it set a couple of days before it finishes jelling. Sometimes as long as a week. If that happens, just put it back in a pot and add another dose of pectin and reboil. Certo only takes one minute. I typically use certo because that is what we have at our store. Have you done the pressure cooker with blueberries to make juice for jelly? I haven’t because I prefer blueberry jam to blueberry jelly.